Lawyers for Boston Marathon bombing suspect Dzhokhar Tsarnaev are making a third push to move his trial outside Massachusetts, citing a large number of prospective jurors who already believe he's guilty and the personal connections many have to the attack. Tsarnaev's lawyers renewed their bid for a change of venue on Thursday, the same day court officials announced that opening statements will not be heard as expected on Monday because jury selection is taking longer than anticipated. The defense cited the attitudes of prospective jurors in the case, saying of the 1,373 prospective jurors who filled out questionnaires, 68 percent already believe Tsarnaev is guilty and 69 percent have a self-identified "connection" or expressed allegiance to the people, places and/or events in the case. "Stronger support for a finding of presumed prejudice in Boston is difficult to imagine, and the existing record precludes a fair trial in Boston," Tsarnaev's lawyers wrote in their motion. Testimony is expected to begin a week from Tuesday in the trial of Boston Marathon bombing suspect, Dzhokhar Tsarnaev. A spokeswoman for U.S. Attorney Carmen Ortiz declined to comment on the defense request. U.S. District Judge George O'Toole Jr. rejected two earlier requests to move the trial, saying he believes a fair and impartial jury can be chosen in Massachusetts. Tsarnaev's lawyers urged the judge to stop individual questioning of jurors immediately, order the trial moved and hold a hearing to determine where it should be held. The judge did not immediately rule on the request and continued questioning prospective jurors. The defense included excerpts of juror questionnaires in its motion. "Why waste time on this guy you know he is guilty," one prospective juror wrote. Another person, when asked if there is anything the court should know, wrote, "We all know he's guilty so quit wasting everybody's time with a jury and string him up." Another wrote, "For this case I think a public execution would be appropriate, preferable by bomb at the finish line of the marathon." Another prospective juror mentioned close friends who work in the emergency room at Massachusetts General Hospital, which treated many of the people injured in the bombings. "My friends still have nightmares of that day!" the potential juror wrote. 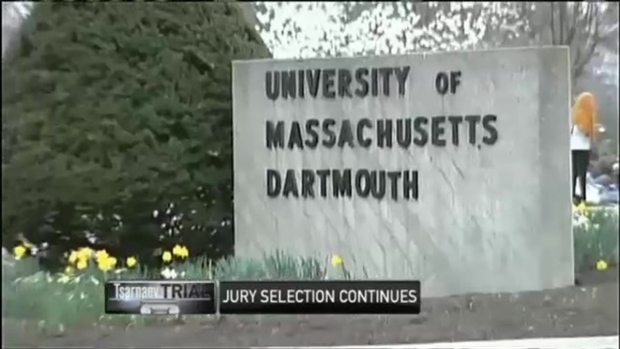 The defense also listed prospective jurors and their close connections to the marathon or the bombing. Among them: an ER doctor who personally treated Tsarnaev and his brother after they were apprehended. O'Toole had originally said he hoped to question 40 prospective jurors each day, but he only questioned a total of 61 people over four days. The process has been slowed as the judge has probed prospective jurors at length about whether they have already formed on opinion on Tsarnaev's guilt and about their feelings on the death penalty. Only jurors who express a willingness to consider both execution or life in prison as a punishment can be seated on the jury. During the first four days of questioning, many people have said they could not impose the death penalty under any circumstances. Many others have said they already believe Tsarnaev is guilty. A small group of people have said they can be impartial and can consider both life in prison and the death penalty. Massachusetts abolished its state death penalty three decades ago, and numerous attempts to reinstate it have failed in the state Legislature. Tsarnaev is being prosecuted under the federal death penalty statute. He is accused of 30 crimes - including 17 capital crimes - for allegedly working with his brother, Tamerlan, to plan and carry out the 2013 attack, which killed three people and injured more than 260. Tamerlan Tsarnaev died in a shootout with police days after the bombings. In announcing the delay Thursday, Ginny Hurley, the outreach coordinator for U.S. District Court in Boston, said jury selection is taking longer than anticipated "in the interest of thoroughness." Opening statements from prosecutors and Tsarnaev's lawyers were originally scheduled for Monday, but Hurley said that date is now "unrealistic." No new date has been set. The judge is hoping to get a pool of about 70 people. At that point, prosecutors and Tsarnaev's lawyers will be able to eliminate prospective jurors for strategic reasons. A panel of 12 jurors and six alternates will be seated to hear the case. For up-to-the-minute news and weather, be sure to follow us on Twitter and like us on Facebook. Sign up for our new breaking news email alerts by clicking here and download our free apps here.